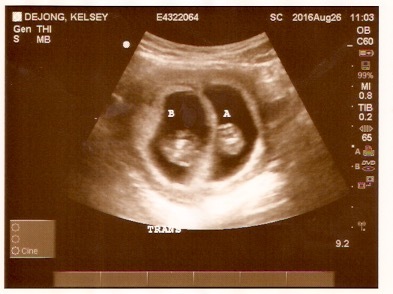 We have the biggest news- we are not only pregnant, but we're having TWINS! We've known we were pregnant for awhile, but just recently found out that it's TWO babies! We were so shocked and have been feeling many emotions- amazed, excited, overwhelmed- but most of all we are very thankful for these two little blessings. 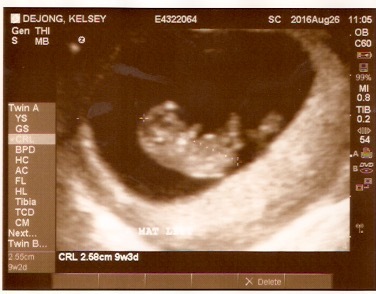 Here's what we know so far: The due date is March 27, but will most likely go before that as most twins come early. They can't tell 100% yet, but they are most likely fraternal twins because they have two sacs. They have high hopes (and so do we!) that this will be a healthy twin pregnancy because I've thankfully always been healthy and Norah was a (past) full term, big/healthy baby. 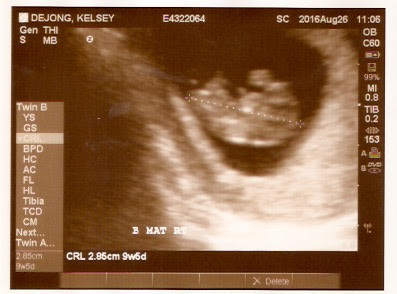 We will keep you updated, but wanted to share the crazy, wonderful news! Can't believe we have TWO babies on the way. I was listening to the song Good, Good Father and the line, "You are perfect in all of your ways to us," just made me cry. We are very grateful that this was His plan and He always knew this would happen. He's been orchestrating these beautiful babies for a long time already! And Norah will be the best big sister! She has met several babies recently and is so kind and gentle to them. That will be so fun to watch her cuddle her new siblings, but first we are going to soak up all the time we can with her as our one and only! I don't think she fully understands, but she will point to my belly and say, "Two babies!" and it's so cute. Norah, you will be the best big sister! Times two! These ultrasound pictures are only a week and a half apart from our first ultrasound with Norah. With Norah, she just looked like a circular blob, but it's so amazing that you can see their hands and feet already! Yeah, the De Jong family is growing.So happy for you.